So that means that heating air is inherently not very efficient to begin with……the higher the humidity in the air, the better it transfers heat, the drier the air, the better it transfers the cold. On the other hand, water has excellent thermal conductivity properties. It also can store and transfer heat very effectively. Therefore hot water heat is the most efficient way to heat anything. Water is also a very effective way to cool things, hence the way a nuclear reactor is cooled. Remove the water flow and we all have witnessed what happens…. 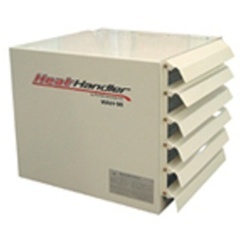 Heat handlers are an easy way to make heat; they also allow folks with forced air furnaces to utilize hot water heat and realize some cost savings compared to burning fossil fuels. If you live in an area where you need air conditioning most of the year, then forced air makes sense and I would not worry much about effeciency loss either. If you are starting fresh with no heating system, the radiant In-floor heat is something you’ll never want to live without, once you have experienced it. 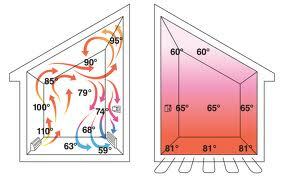 There is very little temp diffrence between the floor and ceiling, which cuts down on heat loss through your roof. Your floors are warm as are your feet; toasty warm as we call it. The picture on the left shows a typical hot water/hot air system. If you have to have air conditioning in the summer through your central air system, this would be how it would be set up utilizing the exsisting plenum. 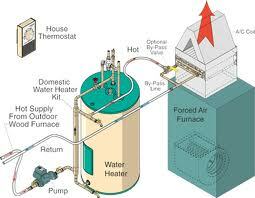 There is also a way to heat your domestic hot water with this set up. The Pro Fab Heat Handler is a complete self contained plug and play system that works great with the HPBA Vesta Award Winning Elite 100 and 200 Gasification boilers.